"Bike for Change is a chance to demonstrate the unconditional love of Jesus Christ in a real and tangible way for those at the Baptist Children's Home." 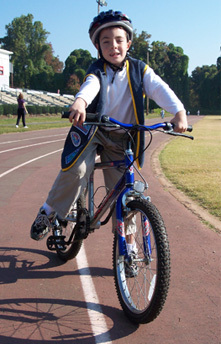 Bike for Change is a fun and dynamic way for children to help "change" the lives of North Carolina children in need. By pedaling bicycles, children raise support and awareness of the boys and girls living at Baptist Children's Homes of North Carolina. Baptist Children's Homes is a non profit organization that provides residential care to abused, abandoned, and neglected children. BCH is frequently referred to as "North Carolina's largest family" as it meets the physical, emotional, and spiritual needs of hundreds of children across the state each year. Bike for Change allows children to reach out and help BCH residents by raising funds and awareness of the needs through a biking event. Bike for Change is a perfect opportunity for schools, churches, and other children's groups looking for a meaningful service project. Your donations are greatly appreciated and additional groups are encouraged to inquire about participation in Bike for Change. All proceeds of Bike for Change go to support Baptist Children's Homes of North Carolina. Baptist Children's Homes is a 501(c)(3) organization. Baptist Children's Homes is accredited by the Council on Accreditation for Children and Family Services, Inc.